The quilt was made by Mrs. William Clish and others at Annfield Plain, Co. Durham in 1913. It was later owned by Mrs. Josephine Clish and is now part of the collection of The Embroiderers' Guild of SA Inc. Museum. Another quilt by the same maker and in the same pattern but different fabrics, is in the Beamish North of England open air Museum. Crazy patchwork quilt made from silk and cotton fabrics, in patterns and plains, in bright colours. Patches are arranged around a central diamond shaped patch in yellow which is bordered with light blue. All seams are covered with featherstitch and herringbone stitch. Patches were stitched onto a calico backing. A recent calico backing ahs been added and dark blue binding attached to the edge. No padding. The backing is maroon cotton. 1600 x 1600 mm. 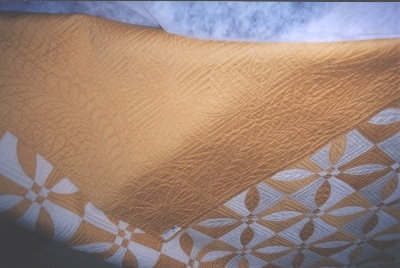 Wholecloth quilt, yellow sateen both sides. 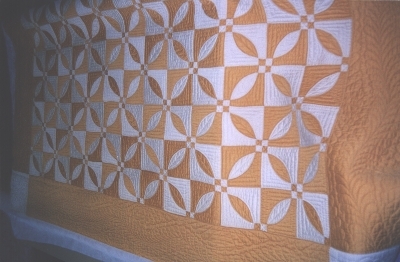 Hand quilted in geometric and curvilinear patterns. Edges turned in, hand finished. Stuffed with flock-like material said by the donor to be wool. Approximately 2.5cm thick.